Which is the Best Massage Chair Pad for You? Massage cushions are some of the most cost-effective gadgets you can buy. They allow you to turn any comfy chair into a personal masseuse, and they save your back over long car rides that could otherwise cause aches and pains. Whether you’re looking to save money over a traditional massage chair or make your commute a healthier, more relaxing journey, massage cushions are a really great new product. However, as with all new gadgets, some are effective, and some are just gimmicks. There are dozens and dozens of them on the market today, and it can be time consuming and frustrating to wander through all the different choices. We’ve done the hard work for you, comparing all the options on the market right now. We took a close look at features, specs, and prices, and read every single user review we could find for these cushions. We’ve looked at everything from the big name brands, and lots of off-brand competitors. In this guide, you’ll find our Top Three recommendations for the best massage cushions available today. Below, we’ve put together our own in-depth reviews of each model. You can find out why we think each is better than the competition, and get a quick sense of which one is best for you! Our most budget-friendly recommendation comes from Gideon. It’s a popular “as seen on TV” model with basic vibration, heat, and cooling features to jazz up your car seat or home chair. We like it for the price, and for the extra climate control features which you won’t usually find in the budget range. It’s very affordable. You can buy the Gideon for about $50. That’s as much as a lot of gel cushions that don’t provide any massage capabilities. It’s a good choice for people who haven’t used a massage cushion before, and want to see if one will make a difference for their back stiffness, or improve their drives. It has 6 vibration nodes which provide targeted relaxation to your back and leg muscles. They line up in 3 lines, with two behind your shoulders/neck, two at your lumbar, and two under your thighs. Reviewers said the lower back nodes were especially effective. They appreciated the added lumbar cushioning, too. While it’s not an intense treatment to relieve severe pains or muscle problems, previous buyers agreed overwhelmingly that this was a great way to relax on the way home from work, or while reading before bed. There’s heating and cooling built in. 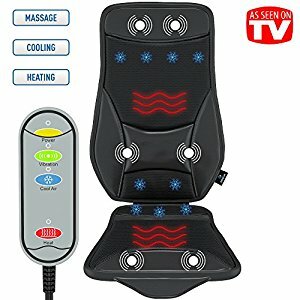 Most massage cushions only have the vibration feature at this price, so getting functional heating and cooling is a big bargain. The heat targets the middle of your back and upper legs, to relax large muscle groups. The cooling elements focus on sweaty spots like the hips and shoulders. You can control everything from a handy remote. Each feature gets its own button, so you can turn each one on and off independently to get a custom experience. It works in the car or at home. This cushion has traps to attach to your car headrest, and it folds up easily to move indoors. You can drape it over an armchair, or use the straps to fasten it to an office/gaming chair. You can also use it while lying down. You get power cords thrown in for both 12V car power and standard A/C household current. We especially like how long the power cords are, with a 6-foot reach on each one. It’s made with a blend of breathable mesh and imitation leather. Previous buyers said it regulates temperature very well, and doesn’t get as smelly as other cushion materials. The heating and cooling elements are rather small. If you’re on the heavier side, you may find that there’s not room between your body and the cushion for the fans to work properly. The heating elements are also designed to work in only targeted areas, so they don’t provide as immersive a heating experience as some more expensive options. Some buyers didn’t find it comfortable when the vibration function was turned off. Unlike our more expensive recommendations, this Gideon is very light padded, which means that when you’re not using it, you’re going to feel the nodes poking you. While we like this one for 20-30 minute commutes, it’s probably not something you want to sit on for a long road trip. It’s relatively loud. One other disadvantage of the light cushioning on this model is the fact that it makes a very distinctive hum. It’s not enough to stop you being able to watch TV, but it’s certainly louder than nicer models. You can’t adjust the heating or cooling. It’s all or nothing, sadly. You can’t adjust the vibration, either. Some larger users found that it didn’t reach their whole back or legs. While most buyers said they got a good fit, some bigger folks found that the shoulder nodes hit a bit too low, and that the lumbar nodes were hitting their hips uncomfortably. It’s probably not a good choice for people over 6 feet. It only has one mode–vibration. It’s very effective for general relaxation, but it can’t provide the sort of targeted, deep-tissue treatment that shiatsu machines with moving nodes can give you. Our midrange recommendation comes from Gideon as well. It provides a few upgrades over the “Luxury” model we’ve recommended above. The biggest improvement is the addition of shiatsu massaging nodes, which move around to actually work into your muscles. This one’s an excellent option for people with chronic muscle stiffness or pain that requires more than vibration. It’s less expensive than other shiatsu models, and offers many of the same features at a bargain price. As with the other Gideon model, this one works in both the house and car, and can be laid flat on a bed or sofa. It comes with dual power adapters, and mesh fabric lined around the edges with imitation leather. It follows the same basic format, including integrated heat, only the whole thing is built a bit more sturdily, and with more features under the covering. The biggest upgrade this model sees is shiatsu techniques. It has 4 massaging nodes built into the back of the cushion. These balls move up and down the cushion, and turn in place to work into your muscles. That means this Gideon can actually work into deep tissues that the vibration nodes on its cheaper sibling won’t touch. It’s highly adjustable. There are three shiatsu modes to choose from: rolling, targeted, and by zone. A rolling motion cycles up and down your back, kneading along the way. Or, you can use the arrows on the remote to move the nodes up and down your back to choose one specific muscle group to massage. For zones, you get a choice of upper back, lower back, or full-back. There are two shiatsu speeds to choose from, no matter which position or pattern you select. It has vibration, too, to help you relax. The vibration features are located under your thighs and hips, to help you release tension. There are three vibration levels to choose from, and you can also switch the vibration off if you prefer to work your back without the extra feature. Between the shiatsu kneading feature and the vibration system, previous buyers were much more impressed by the overall sensation on this one compared to the cheaper Gideon. While buyers who went with the vibration-only model said they wouldn’t recommend it for anyone who needed more than relaxation, folks who opted for the vibration+shiatsu model said they found it helped with fibromyalgia, chronic back pain, and other more serious issues. There’s a timer built into the remote. You can choose between 5, 10, and 15 minute sessions, and the cushion will shut itself off automatically when your session is over. It’s a good way to prevent overworking your muscles and overheating the machine, especially if you’re at home in a comfy armchair where you might nod off. It’s still very affordable. This one costs close to the $100 mark, but it’s still $50+ cheaper than most other shiatsu cushions. It doesn’t have any shiatsu nodes on the bottom. The only massage your thighs will receive is vibration. It’s the same feature as the cheaper Gideon, and we liked it well enough on that model. However, some buyers were disappointed that there wasn’t more of an intense massage for their legs and hips. The bottom of the cushion also lacks heat, which is a disadvantage. There’s no cooling function on this one. If you’re in a hot area and looking for a cushion that will dissipate heat, you’re out of luck with this model. You can’t adjust the positions of the shiatsu zones. That means some people, depending on body shape, just won’t find a good fit with the back massage unless they manually select a target spot. That’s not convenient, and it leaves buyers close to/over 6’ out of luck. It doesn’t have a perfect record for reliability. Some buyers found that their cushions stopped working after only a few uses. The main problem was with the moving rollers, which stopped changing positions. However, it was only an issue for a very small number of reviewers. There’s no warranty period listed, though we did notice that the manufacturer had responded to reviews that mentioned durability issues. We’d love to know how those situations were resolved. It’s not the most high-end model out there. As with the cheaper Gideon, this one has hard plastic nodes which can be uncomfortable to sit on for extended periods of time. Some buyers also found that the mesh was a bit too rough–this one’s not a great choice for use on bare skin. Our top quality slot goes to the HoMedics shiatsu cushion, which is essentially a higher-end version of the Gideon we’ve just reviewed. It has a thicker build, with more intensive shiatsu nodes that can handle lots of deep tissue work. It’s the best choice for people who need an intense massage, but can’t afford a full chair. It has a lot of the same features as the vibration+shiatsu Gideon: a heated back, massaging shiatsu nodes, and vibration motors. There’s a mesh central section to help transfer heat to your muscles, and a remote control for making adjustments. In nearly every department, the HoMedics feels significantly better. It’s the thickest of the three. The nodes are slightly more prominent than the Gideon models, and the cushioning is thicker as well. Overall, it feels like a more deluxe cushion than our other recommendations. It has the biggest range of techniques and features: percussion through vibration, kneading with shiatsu, and rolling that moves up and down your back to loosen longer muscles. Unlike the Gideon above, it has both vibration and shiatsu options available for the back of the cushion. The Gideon only vibrates on the seat of its cushion. It has 2 sets of massage nodes, where the Gideon shiatsu unit has just one pair that moves around. The HoMedics has one fixed pair at the lumbar, and an upper pair that rolls up and down from the middle to the top of your back. It increases your coverage while maintaining proper lumbar engagement. The double nodes are a more durable design, too, since there are fewer moving parts. Only one of the sets has to move around while you’re in your session. The seat material and the edges are made from a microfiber that’s softer and more comfortable than the fake leather on our other recommendations. It also feels less chintzy, blending in better with quality furniture. It’s made by a company that has a good reputation for making home medical and massage products. While the Gideon models are popular, they’re made by a relatively new company that’s more “as seen on TV” than “as recommended by doctors.” HoMedics is a very reputable company for home treatment devices, and you can see the extra design effort they’ve put into this model. It’s pretty aggressive. As we’ve said, this unit has very prominent nodes, and they also work into your muscles more intensely than the Gideon’s. The other key disadvantage for people seeking a gentle massage is that there’s no way to turn down the intensity on this model. Many buyers recommended that you use a towel or wear thicker clothing, since you can’t turn the intensity down. That’s also the main reason we don’t recommend using this one in a car. It’s not comfortable to sit on when it’s not working, so unless you have a 15 minute commute (or shorter), we recommend using this one only at home. This one also doesn’t come with a car power adaptor. Some buyers thought it was cheaply-made for the price. They said the fabric felt rough, and one buyer said their cushion was fraying slightly after a few months of use. Even the nicest of our recommendations isn’t good for taller folks or people with long torsos. As with the Gideon units, if you’re close to 6’ or even taller, you may find that the upper nodes don’t reach above your shoulder blades. Some buyers found that the nodes hit their shoulder blades. This one’s not as impressive over the long term as we’d like it to be for the price. It doesn’t have very good quality control.There are also some reliability issues. Buyers didn’t report promising experiences with with HoMedics customer service. The vibration-only Gideon is the perfect choice for people looking to save money, or people who are looking to try out a massage cushion for the first time. It’s very inexpensive, and has more features than other budget models. We especially like the range of climate control functions this one has compared to other cheap options. However, since it doesn’t have shiatsu kneading or rolling massage nodes, it’s only good for relaxation, rather than deep tissue work. The shiatsu/vibration Gideon is a more immersive, complete option for folks who want something that kneads as well as vibrates. It offers most of the same functions as the HoMedics, for at least $50 less. The shiatsu nodes work muscles more deeply than the cheaper Gideon, and there are more options for targeting your massage to specific muscles than you get on the vibration-only model. This one also happens to be the most adjustable of the three, even though the HoMedics has more of a range of massage techniques. On the downside, it feels cheap compared to the HoMedics, and it doesn’t have a great reputation for reliability. It’s best for people who want something with shiatsu massage nodes to use in the car, since the HoMedics is only for home use. The HoMedics is our top recommendation for people who need their massage cushion to alleviate chronic muscle tension or serious knots. It’s more intense than either Gideon, and it has the most massage techniques under the hood. Plus, it simply feels the nicest in terms of fit and finish and motor power. However, since it’s so intense, we don’t recommend it to people who just need to relax. It’s best for folks who really need a thorough massage for their back muscles. This one is also quite expensive, at 3X the price of our cheapest recommendation. It’s probably overkill for people who won’t use it every day. Massage cushions are usually available from $50-$200. There’s a lot of variety, but the general rule of thumb is that you’ll pay more for each additional function or feature. So, massage cushions that just vibrate are on sale from $50, while massage cushions with vibration and shiatsu kneading usually cost $100+. You’ll pay the most for units that have vibration, kneading, and rolling massage all in one package. They usually cost between $150 and $200. People who will just be using their cushion to relax probably don’t need to spend more than $50 to $75. Vibration is enough to sooth tired muscles and help you unwind at the end of the day. If you need to work on serious knots or muscle pain with your massage cushion, you should plan to spend $100-$150. Before you pull the trigger on any massage cushion, figure out where you’re planning to use it. Most massage cushions are designed to work on both car seats and on household furniture. However, not all models are designed to be used in vehicles. If you’re hoping to use your massage cushion in the car, be sure to find something with a 12V DC power adaptor and straps to attach to your car seat. As you’re comparing models and features, think about what makes your back feel the best. Do you need a light massage to gently ease your way out of the work day, or do you need a vigorous rub-down to work out knots in your back? Does heat help, or does heat make you uncomfortable? Figure out whether you want a shiatsu-style massage, or a percussion-style massage with vibration. Knowing all your preferences will help you decide between different models. Finally, we’re sorry to report that like many emerging products, massage cushions aren’t very durable or reliable over the long term. Many develop problems with either the massage motors or heating elements over extended use. Quality control is also a weak point, and a fair percentage of buyers also end up with units that don’t work on out of the box. Be sure to inspect and test yours thoroughly when you receive it. It’s also important to check the warranty on your model, so you know your options if something goes wrong. Where possible, choose models with warranty coverage or satisfaction guarantee periods, and buy from reputable brands. Want to compare more massage cushions? Want to know more about the best massage chairs and other massage products? Check out the best sellers on Amazon!